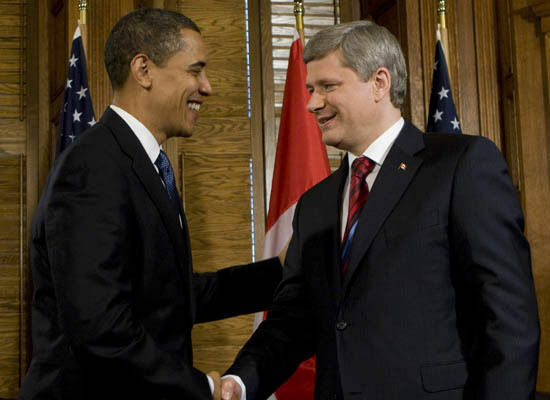 President Obama and Canadian Prime Minister Stephen Harper shake hands. :: The President, in his first foreign trip since being sworn in to office in January, visited Canada today, where crowds of Canadians greeted him with cheers and American flags. As Obama pulled up to Parliament Hill under gray skies, a cheering crowd of more than 1,000 people greeted him. A woman along his motorcade route carried a sign that read "Yes we CANada!" Obama touched down late morning in Ottawa, heading into a day of meetings. He came bearing a pro-trade message to assuage Canadian concerns over protectionism; a promise of a new strategy in Afghanistan as Canada moves to pull out all its troops there; and talk of clean-energy cooperation as controversy hangs over Canada's massive oil-rich tar sands. "The world's most recognizable man"
"Obama is like the sun, too powerful to look at directly"
"Obama is CHANGE writ extravagantly"
"The western world's only political rock star"
It's a sunny, cold Saturday morning, and you are outside getting ready to take your kids to their weekend activities. Your son has a one day camping trip with the boy scouts, and his ride shows up to get him. A near by, huge, thundering, explosion causes you to jump and shake with fear. You look up and see smoke and fire rising from the street behind you. You tell your son and daughter to get back in the house, and rush in behind them. You hear the sirens and turn on the tv. The news has broken in to programming and is telling you that it's Canada, with whom we have had a peace accord for a year or so, launching rockets at us. They note that a woman died when this rocket struck a house. Over the next months, you keep your children close. You are even afraid to send them to school, but you do because you must. More rockets fall, all from Canada. Two more casualties. It is a good thing that Canada is not nearly as well-armed as we are. You wonder why the US does not respond with our own rockets, aircraft, whatever else they need to prevent more Canadian rockets from landing on US soil. You wonder why Canada elected a terrorist group to run their government. A group called "al Qaeda" which has very vociferously announced it's intention to annihilate the United States. You think about what they have already done to us using airplanes, suicide bombers, and more. 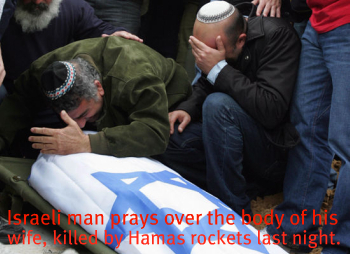 You cry, and you pray that the US will stop the rockets from Canada soon. The economic blockade that the US implemented when al Qaeda took over the Canadian government (elected by the citizens of Canada, knowing full well who and what al Qaeda is) has done nothing to solve the problems.